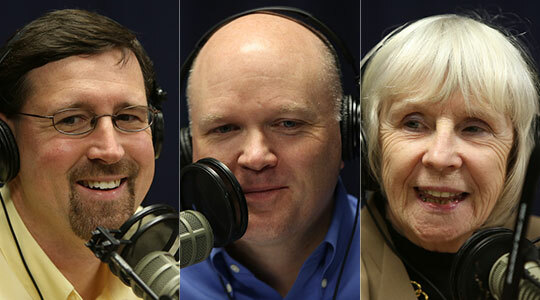 Summary of today’s show: Our usual Thursday panel of Scot Landry, Susan Abbott, Fr. Roger Landry, and Gregory Tracy on Thursday discussed the news headlines of the week, including the bevy of newspaper editorials opposing Question 2; the Pilot’s own editorial on the assisted suicide question; Scot’s column in the Pilot answering proponent’s claims in favor of Question 2; Fr. Roger’s column in the Anchor on how Catholics should vote; and the surprise announcement of six new cardinals for the Church. 1st segment: Scot Landry welcomed everyone to the show and welcomed Susan Abbott back to the show. She said this past week there was a wonderful workshop on bereavement ministry and on her parish on Monday, she started the Catholicism series by Fr. Robert Barron. She’s also working on the revision of religious education guidelines for Catholic schools and parish religious education. Scot noted that Gregory Tracy will be on vacation next week. Fr. Roger Landry said it’s been a busy few weeks for him. They had over 100 people come to an event preparing for the launch of the Year of Faith. Next week, he has eight talks in six days in five states, not to mention All Saints Day and All Souls Day. He’ll be in Tennessee first, talking about a couple of colleges and the Nashville Dominicans religious community, Rhode Island, New Hampshire, Massachusetts and then in Philadelphia the end of the week. It’s been a great time of graces so far in the Year of Faith, not necessarily doing new things, but doing what we’re doing with a far greater trust in God. Scot noted that we could be hit with a hurricane or tropical storm at the beginning of next week. Susan noted that last year there was a huge snowstorm that hit this area. Scot said in the stories this week, the Pilot wrote editorials asking people to vote non on Questions 2 and 3, outlining the rational arguments against the questions. Greg said the flaws are obvious to anyone who wants to look at these laws, they don’t have to be Catholic. Scot quickly outlined the the laws of the law in the editorial as well as all the other groups that oppose Question 2. Scot said proponents have cited very small, alternative medical groups in favor. Scot asked about the editorial opposing Question 3, legalizing marijuana. Greg said that it’s clear in certain cases some people are advocating it for medical purposes, but once you open the door it gets out of control. In California, the reality of legalization has been to have marijuana dispensaries selling more marijuana than the possible valid patients. Back to Question 2, Scot turned to some local newspaper editorials opposing the Question. He said the Salem News mentions the argument that the legislature and legislators should take this up. Susan said issues this serious shouldn’t be left up to a one-time vote. It begs to be discussed by the legislature with input from experts and constituents. With the graying of the population and advances in end-of-life care for all ages, Massachusetts needs to have a wide-ranging, intelligent and respectful debate about assisted suicide. Our legislators need to find the political courage to confront a raw, emotional issue and craft a law that recognizes our right to make our own decisions about our quality of life while offering safeguards against misuse or abuse. Question 2 is not that law, and we urge a No vote. Scot said they are more opposed to the law because of the way it is crafted rather than the morality of it. Two weeks ago, the New Bedford Standard Times came out with a similar editorial. Fr. Roger said the newspaper editors said they support a right to suicide, but that this particular law as proposed doesn’t protect the vulnerable. The Boston Herald also came out with an editorial against Question 2 this week. It is tempting to consider support for Question 2, the so-called “Death with Dignity” act, which seeks to ease the final days of terminally ill patients. None of us wants to see a loved one suffer; we do not want to endure such suffering ourselves. We can all imagine that moment when we might seek the ultimate escape from indescribable pain. But the ballot initiative is deeply flawed. The Herald recommends voting NO. The new law would allow willing physicians to prescribe a lethal dose of medication for patients who have been diagnosed with an incurable illness that will cause death within six months, and who ask for the prescription that they would self-administer. Of course, such an estimate of life expectancy could easily be wrong. The patient must be deemed mentally competent, but is not required to undergo any counseling to determine if the request may be motivated by, say, treatable depression. That is reason enough on its own to vote no. It’s conceivable that some patients would resort to the lethal prescription not to ease their own suffering but to unburden loved ones. And there is deep concern about Question 2 within the medical and disability communities. We are fortunate in this country — and in this commonwealth — to have a strong network of end-of-life services for the terminally ill. Hospice provides compassionate care. Access to palliative care could be improved, and that should be the focus of those who are committed to humane and dignified treatment of the dying. Scot said a flaw in the editorial is that it makes it seem that suffering at the end of life is inevitable, but palliative care experts disagree and say that there is very little pain that can’t be alleviated. Greg said he was happy to see a major Boston newspaper that came out against this Question. He said that he’s heard some claim that if it’s okay to that amount of morphine needed would end up causing death inadvertently, then this should be legalized. But as Cardinal Seán has said that this isn’t the case. Susan pointed out that the intention is to relieve the pain, it’s not to kill the person. Scot said every major newspaper in Massachusetts that’s taken a position on Question 2 has been opposed. Fr. Roger said he would be shocked if one paper didn’t take a position in favor simply because of political associations, but he’s edified that so many newspapers agree that this particular initiative would be bad law. Of course, the truth of the matter is not determined by how many editorials are opposed or in favor. He encouraged people to write letters to editorial boards to thank them for the stand or to take a stand against. He noted that the more emphatically this Question is defeated, the less likely it is to be successful before the Legislature. Greg noted that with ballot initiatives, the wording of the law is crafted by those who are extreme advocates. If you’re going to have a law, have it drafted by a neutral party like legislators. He noted that every definition and the wording is expansive. Also in the Pilot is a story about 17 religious leaders, including Cardinal Seán, signed an agreement opposing physician-assisted suicide, based on a set of four criteria: The 6-month prognosis, doesn’t require consultations, doesn’t require family notification, and that the lethal prescription is not a death with dignity. Scot encouraged listeners when discussing this Question refer to it as a bill legalizing assisted suicide, not the euphemisms proposed by those in favor of the ballot question. There was discussion of the prescribing of the lethal pills from the neighborhood pharmacy, not from the doctor’s office, nor is there any control over the drugs once they’re out in the public sphere. Scot said Cardinal Seán asked him to write in the Pilot with responses to the claims made by proponents of Question 2. Susan said it’s a valuable one-page look at the pros and cons. Scot said what he hoped to do in the column is to provide assistance to someone who knows he’s going to get in a debate with a proponent of Question 2. Also in the Pilot this week is the text of Cardinal Seán’s homily that will be heard in all archdiocesan parishes this weekend. Tomorrow’s show will be devoted to this homily. The video of the homily will be on Cardinal Sean’s Blog on Friday night. Scot encouraged everyone to spread the homily through their social networks on Facebook, Twitter, and elsewhere. Susan said she also liked the column by Jaymie Stuart Wolfe called “The final enemy” on this topic. Susan said Jaymie looks at those who have lived terribly tragic lives and are afraid of dying alone and reminds us that it is to ensure that they don’t die alone, but surrounded by love. 2nd segment: Scot said Fr. Roger’s column in this week’s Anchor is entitled “How does God want you to vote?”. Fr. Roger said it’s about the proper formation of conscience. He said people are often confused about how this occurs. He said it’s about asking the Lord the question in prayer, examine his values, and become salt and leaven. Voting is a moral action that makes us morally better or worse. In a choice between a candidate who recognizes that abortion is the massacre of innocent human beings and intends to work to reduce and eliminate it and one who celebrates abortion as a great civil “right” and even wants to force Catholic individuals and institutions to have to pay for it, is it complicated to figure out which candidate’s values God wants us to support? Similarly, would He want us to vote for or against candidates and legislation that would give doctors the ability to help patients commit suicide? God instituted marriage in the beginning as the union of one man and one woman, as a reflection of His own image. Would He want us to support candidates who see marriage as He does or those who believe that such an idea of marriage is bigoted, unconstitutional, and needs to be redefined to embrace husband-less or wife-less unions? God founded a Church, calls us to use our freedom to live our faith through acts of charity, and wants us to be people who conscientiously follow His voice. Would He want us to support candidates who defend freedom of conscience and religion or those who want to use their office to compel Catholic institutions, priests, nuns, families and businesses to pay for other people to have free chemical abortions, sterilizations, and contraception? The answers, for those of a well-formed conscience, aren’t complicated. He said God cares who our leaders are. That was true in the Old Testament and is still clearly true. Catholics are consecrated, which means we’re different, and so we should be transforming society rather than just reflecting it. Scot said people often say their conscience compels them to favor things the Church’s teaches are immoral. Fr. Roger said conscience is not personal preferences or gut instincts. Conscience is an organ of sensitivity given to us by God to hear his voice to do or avoid something or to see if something we did or failed to do accorded with what he wants us to do. We know we are hearing him correctly when we are in accord with his Revelation as safeguarded by the Church. He said we should prepare to vote by praying, by consulting the saints, and by becoming informed of Church teaching. He said many Catholics have not formed their consciences well and he said many priests have to express sorrow for having failed to be clear about what the conscience is and have failed to teach clearly the obligations of the Catholic faith. Scot said last week he was part of a panel at St. Mary parish in Dedham on current events, especially ahead of the election. He said people wanted guidance on how to vote. People asked why they don’t hear more about this in the Church. Scot said when secularists out there don’t like what they hear from us, they run to claim separation of church and state. Scot said the Church can’t endorse a candidate from the pulpit, but the Church can express the principles for how a Catholic should balance all the different moral questions. Before we got into the ballot box, we have to think about it as an action of faith. Susan said another resource is the US Conference of Catholic Bishops which puts out succinct one-page briefings on Catholic teachings related issues of the day. Scot noted that the Church teaches that there is a hierarchy of values, where not every issue has the same moral weight. Greg said that the right to life is the pre-eminent right. If you’re prevented from being born, then you don’t even have a chance to be poor or one of the other conditions some would place a greater weight on. Scot said Pope Benedict declared seven new saints in Rome last Sunday. He said also that there was a surprising announcement in which the Pope named six new cardinals. Two of them are significant, Archbishop Harvey, an American who’s been the head of the Papal Household. Also there are no other curial officials or Europeans. The other surprising pick is the 55-year-old Filipino archbishop Luis Tagle. Fr. Roger said he was surprised that Archbishop Gerhard Muller, the prefect of the Congregation for the Doctrine of the Faith, wasn’t picked to be a cardinal. Fr. Roger said he’s always been impressed by Tagle and said he’s been tipped as one of the leading contenders for the papacy from Asia.